Tree Works provides deadwooding and selective pruning services in Charlotte, NC and the surrounding area. Each of these services are also adjusted to meet the specific needs of each client. Tree branches regularly die off and that could present a number of problems. What happens is the branch begins to decay and that eventually leaves it in such a frail state that it falls off. When branches begin to die, a professional team can come out and remove those branches through a process called deadwooding. Safety – Dead branches pose a threat as they could fall and cause serious damage to people. These dead branches could also pose a threat to homes, gardens and even roadways. If there is access to a footpath underneath a tree with dead wood, there could also be liability issues in the event that a branch falls and injures someone. Aesthetics – Trees that contain dead wood throughout its crown are not always very appealing. Removing these branches will enhance the look of a tree’s crown. This process is typically done throughout the year when leaves are not in their initial growth stage. 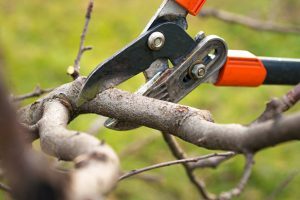 Selective pruning is actually a pruning technique that has a number of benefits and is used to provide a more appealing look to trees. This differs from random shearing as professoinals select particular branches to prune. Less maintenance is required on trees and plants that have been selectively pruned. This service is more cost efficient because it requires less upkeep throughout the year. Helps to maintain the natural shape of the tree. Selective pruning includes different techniques and the team at Tree Works are ready to use our expertise to make your trees more appealing and healthy. Our professional staff uses techniques which serve the purpose of increasing the penetration of light, improving overall tree structure, reducing the weight of the tree and opening up its foliage. Tree Works’ selective pruning service also has a detailed knowledge of how much should be removed. There are a lot of factors that go into that decision, such as the age of the tree, size, species of tree and individual client consideration. Not only does Tree Works perform expert service, but we also offer expert advice that is a result of years of experience in the tree trimming industry.